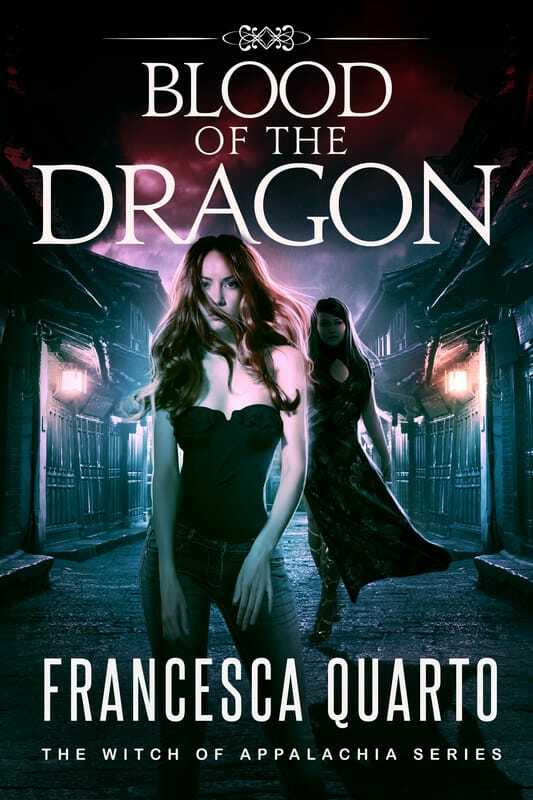 ﻿Francesca, pictured to the left with Ollie, who more times than not sneaks his way into her stories. She is part of a large Italian family where she discovered early on, that a love of reading was as much a part of her DNA as her mother’s skill at baking. Growing up in a house filled with laughter, screaming, banging pots, fighting and loving family bonds, shaped her life and heart. Having moved from the east coast where she was raised between New York and New Jersey, Francesca left for the mid-west where she spent several years outside the Chicago area raising a family of three children, completing her college degrees and writing introspective poetry like other young mothers. 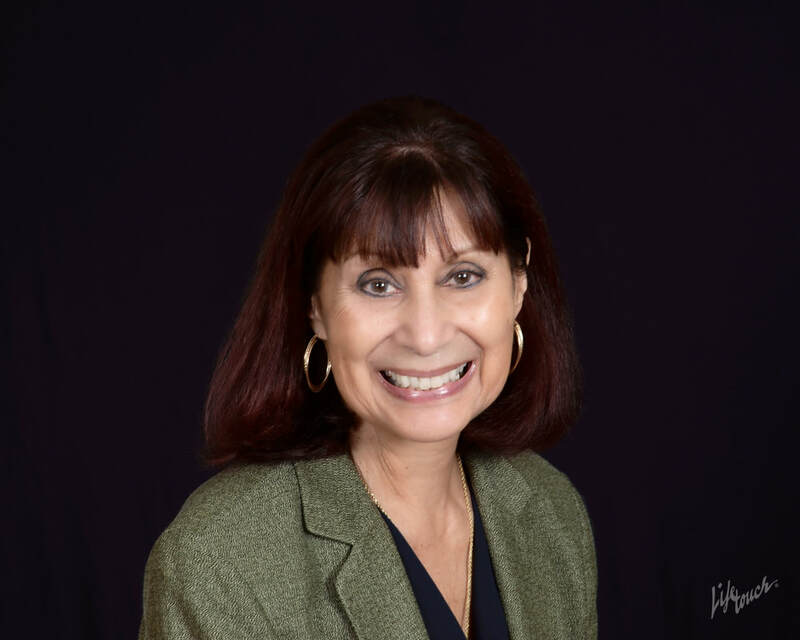 Francesca has worked in local television, a small city zoo, founded a non-profit tutoring agency for an inner-city neighborhood which eventually served local school districts, worked for an International Evangelical Television and Radio Station and for a non-profit organization serving challenged adults. Hear about the series from the author! Celtic Witch Cathleen O’Brien is drawn into her husband Jason’s search for a fifteen-year-old boy, lured away from home by a Warlock known as The Dread Preacher. Their gruesome finding leads them to a ghost town. Named Blood Moon Rising by the ancient tribe of Washoe Indians, the 1800s Nevada town was built over the tribes sacred burial grounds. 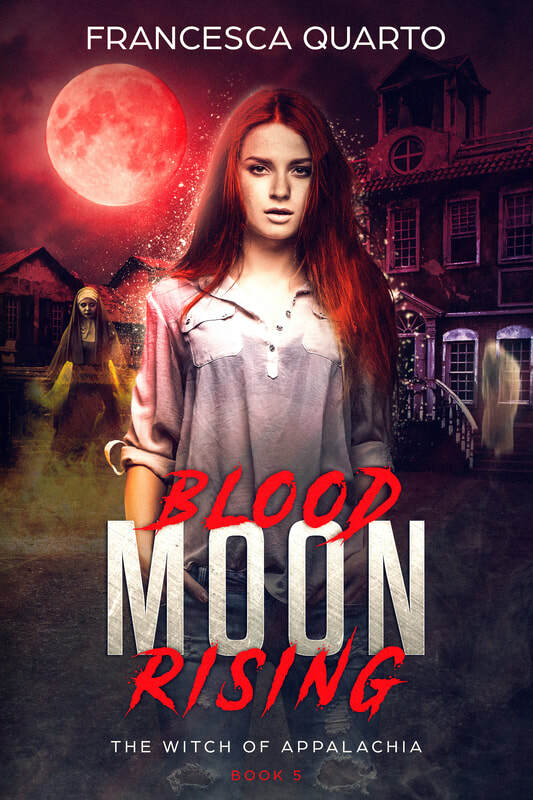 Under the unnatural red glow of the full moon, Cathleen must confront the Warlock’s coven of shape-shifting witches and their Lord, The Father of Darkness. He comes to partake in the feast they prepare for him, of innocent souls. His power is growing beyond even the Cathleen’s! A ceremony set in an Irish castle, surrounded by charming hamlets and rolling hills and ocean. What more idyllic setting could a Celtic Wizard want on her wedding day? Cathleen O'Brien returns to her mother's ancient family home, O'Brinnion Keep, for the much anticipated marriage to her love, Jason Tate. Among the swirl of wedding dress, colorful flowers, and gifts, a curse, laid on her family years before, has found her where she is most vulnerable. Her parents protected Cathleen throughout her life from the dark oath sworn by Arcon Fearsome, the Necromancer, Lord of the Dead. They captured him in their own youth, while in service to the Green Mother. He swore revenge as they dragged him from the Council chambers to his imprisonment on the fourth plane. Now, mere days before her marriage, the Necromancer is the uninvited guest and he brings gifts of fear and death. Cathleen and her mother must call on the powerful Teacher to help destroy this Dark Lord before his curse can be fulfilled. But as in life, death can take surprising turns and in the end we all stand alone. ​Book 3 in the Witch of Appalachia SEries! BOOK 2 IN THE WITCH OF APPALACHIA SERIES! Hidden away on a secluded ranch, the Wiccan sisters hold their Coven retreat, searching for peace and communion with nature among the towering Buttes of Utah. The tranquility of their days is shattered when the girls begin to disappear like water under the sizzling desert sun. They are under attack by unknown forces and even their dreams will make them vulnerable. The Witch of Appalachia, Cathleen O’Brien, has been called upon to rescue the missing girls; if they still live. Searching among the ancient pillars that soar like giants rising from the sandy floor, brings the young Wizard face to face with Morgayne. This half lizard Demon is known in Celtic folklore as “The Queen of Rot”. Cathleen soon uncovers a devious scheme by one of the Coven’s own sisters. Her allegiance is now bound by blood to the Queen, whose evil has subverted her very soul. ​Helping Cathleen to locate the missing girls, her mother, Brighid, uses her “This and That” Magic to protect her untested daughter from the powerful Morgayne. Time is running out for the abducted girls. Soon, they will have only dark dreams in a never ending night. Young Cathleen O’Brien comes from a poor Irish immigrant family, but she was enriched from her earliest childhood by a father who gave her the perfect treasure: Magic. Cathleen is part of a clan of Celtic Mages with Magical roots going back to the Dark Times. Her father taught her the mystic arts of the Magic User and after she purchases a radio station in a remote mountain town, she’ll need this magic to survive. Iron Mountain was a booming coal mining town in the late 1800s, but there is a sinister cloud hanging over this beautiful mountain setting. Old news clippings from those times, tell of town folk being hunted down and murdered and visitors disappearing off the trails, never to be seen again. Legend held that there was an ancient Indian Shaman who was responsible for all the mayhem and his flight into the high mountains was proof enough to all. After his escape from the town’s suspicions and justice, there were reports of giant wolf-like men and other creatures roaming the mountains as part of the Shaman’s twisted pack. While researching the town’s history for herself Cathleen uncovers these old news stories and concludes there was more myth, than magic, at play in the old town. Never one to scoff at any sort of reports of magical powers, she tucks the tidbits of information away. Her detective work takes her high into the densely forested mountain where she finds the howling snow storm is not the only threat to her safety. Her encounter with one of the Shaman’s pack puts her into a life and death race for safety and an unexpected champion who is as terrifying as protective. 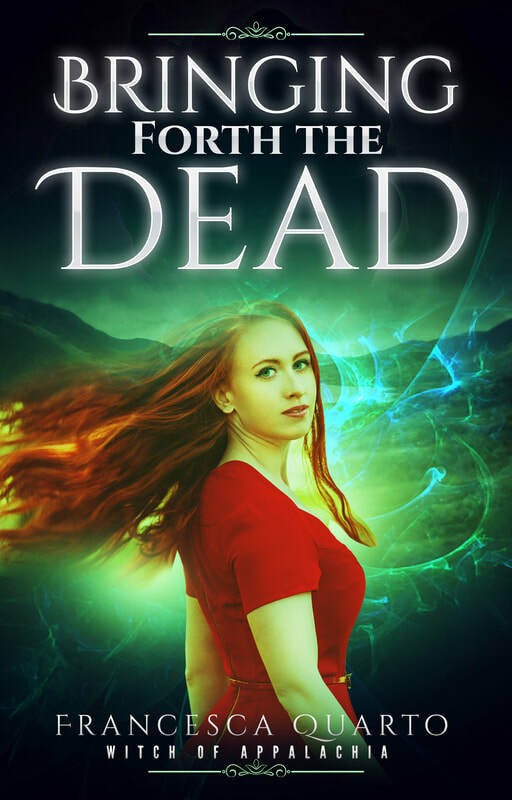 Cathleen discovers she is up against the evil magic of a Skin Walker whose tentacles reach into the quiet town of Iron Mountain, and can touch all that appears innocent and destroy all that is good. Her life is pitted against the changing face of this evil and she cannot predict who or what the enemy is. Cathleen is only sure of one thing; her Magic has grown as powerful as the Green Mother and she can make the world tremble. Barns & Nobles Book Signing...a huge success! 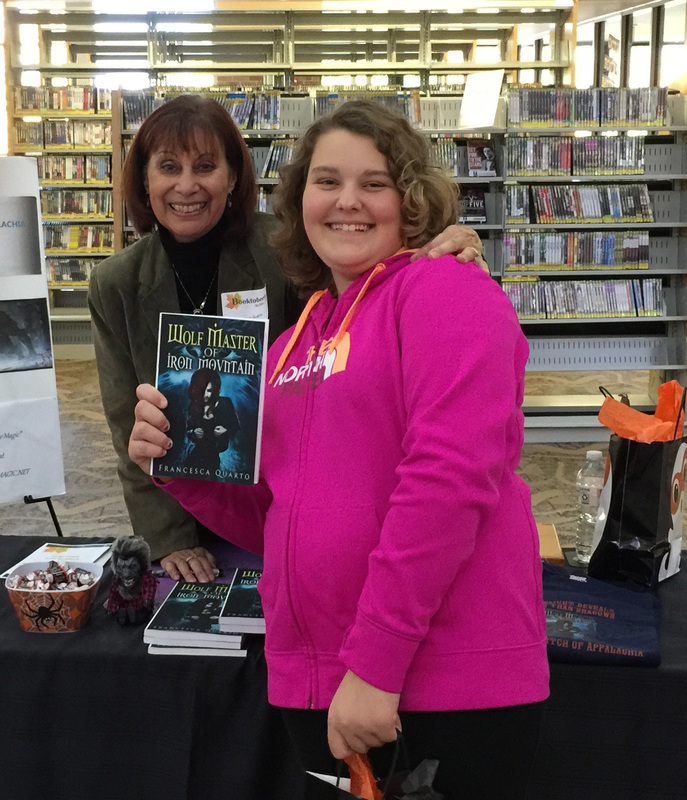 A New Fan Meet at a Library Book Signing! Barns and Noble Book Signing! Another happy fan, met at a library book signing. 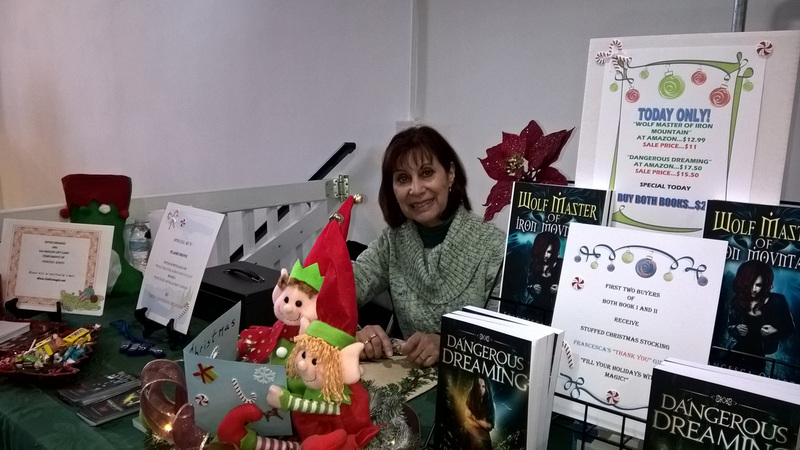 New Author Friends at a Book Fair!